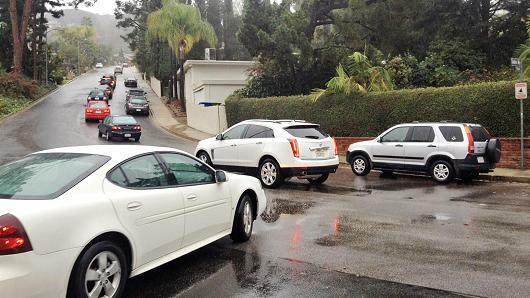 Late last year, Los Angeles citizens began seeing their narrow neighborhood streets flooded with bumper-to-bumper traffic, suddenly transforming peaceful mornings into horn blasting, tire squealing chaos. The surge in congested neighborhood traffic is being contributed to a wildly popular smartphone app known as Waze, which provides drivers with alternative routes to help avoid accidents and/or shave 5 minutes off of their commute. Neighborhoods like Paula Hamilton’s, which are tightly pressed up against the traffic clogged San Fernando Valley and the equally congested West Side, have naturally been the most impacted by the app. But residents have not been taking this lying down; they’ve started to fight back. Using the app, local residents have been reporting phony car crashes and traffic jams to send drivers in the opposite direction. Unfortunately, this strategy has only had a small impact on reducing traffic because it is essentially an ineffective approach; “With millions of users in LA, fake, coordinated traffic reports can’t come to fruition because they’ll be negated by the next 10 people that drive down the street passively using Waze,” said Waze spokeswoman Julie Mossler. That, of course, means that local citizens are still irate over their home turf turning into a public stomping ground. But, to the chagrin of many, this might just be the new law of the land. This entry was posted in Culture and tagged app, los angeles, san fernando valley, smartphone, traffic, waze. Bookmark the permalink.